Michael tore out this piece from The Economist and left it for me on the breakfast table (which is also our lunch/dinner table and coffee table, as anyone who has had a meal with us in London is—no doubt uncomfortably—aware). Here in the UK, Scotland is famous for being the home of the deep-fried Mars bar. Texas has topped the Jocks, as Sassenachs call their friends up north. ON A fine afternoon at the Texas State Fair, a ringmaster encouraged a gaggle of children to flap their arms like butterfly wings. “What could possibly go wrong on a day as beautiful as today?” he asked. But a hundred yards away, something had gone quite wrong. People were queuing for an unusual delicacy: balls of butter, dipped in dough and cooked in a vat of boiling oil. Fried butter, in other words. The balls were dusted with a thin coat of powdered sugar. When bitten, they collapsed with an unctuous squelch. Fairs are known for their decadent snack offerings. Most are unhealthy, and some push the conceptual boundaries of food into new territory. The Los Angeles County Fair, which ended on October 4th, featured a Meat Lovers’ Ice Cream Cone (don’t ask). The Minnesota State Fair is known for its foods-on-a-stick. 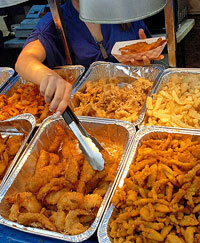 The Texas fair bills itself as the fried food capital of the state. The claim is credible. Sprinkled between the pig races and carnival rides are vendors selling fried ribs, fried guacamole, fried ice cream and even fried bacon. Fried butter is a new development. At the beginning of the fair it won an award for creativity. The inventor, Abel Gonzales, won the same award in 2006 for a different recipe—fried Coke. Nutritionists would shudder at all the fat, sodium and trans-fats. Defenders say that the key is moderation. “If this is not your lifestyle, then it’s OK to indulge once or twice a year,” says a spokeswoman for the fair. Opinions among fairgoers were divided. A woman selling toffee said that people had no business frying butter, with diabetes and high cholesterol as common as they are. She said she preferred to cook with olive oil. But a man eating a basket of fried butter with cherry jam was not too bothered. “It’s just butter,” he maintained. We're all used to hearing "Mind the gap" when we're taking the tube. "We apologize to all passengers but this service is now terminated because of an incident in the first carriage involving bodily fluids. Alight here and wait for the next train." As Michael and the man standing next to him agreed, they could count themselves lucky that they weren't in that first carriage. I read this while we were in France and thought it was one of the most evocative 9/11 accounts I've come across. The article appeared as part of a series by various authors describing the process of writing. Born in Dublin, Colum McCann now teaches creative fiction at Hunter College. His new novel, Let the Great World Spin, is set in Manhattan in 1974, the year the Frenchman Philippe Petit walked a tightrope between the Twin Towers. I haven't read the novel, but I can recommend the excellent documentary on this feat, Man on a Wire. I still have my father-in-law's shoes in a box in the cupboard of my writing room. I haven't looked at them in a couple of years, but they're there, covered in the dust of the World Trade Centre towers. Sometimes I wonder why I keep them at all, but it was in these shoes that, eight years ago, he made his way down from the 59th floor of Tower One. He sloshed through the water at the bottom of the building. Already the neighbouring tower was down. He made his way through the glaucomic storm of debris. He recalls the strange calm of it all: thousands of people moving in the new white atlas of downtown. He walked all the way uptown to the apartment on 71st Street, where my wife and I and our two young children waited for him. My daughter, Isabella, jumped into his arms. She recoiled from the hug and asked if he was burning and, when he told her that it was just the smell of the smoke on his clothes from the buildings that had collapsed, she said, no, no, that he must be burning from the inside out. My father-in-law immediately swapped his clothes. He couldn't stand the thought of the suit, the shirt, the tie, what they held, what they carried. He threw the clothes away, but left his shoes by our door. They stood there for weeks, until we finally figured that we had kept them there precisely because they had carried him out and away to safety. They were, in whatever small way, a beacon of hope. It is still a difficult thing, these days, to pull out the shoes. I still think that every touch of them loses a little more dust. I am paralysed by the notion of what the dust might contain – a resume, an eyelash, a concrete girder, plasterboard, a briefcase, a pummelled earring, another man's shoe. They sit in a cupboard behind me, over my left shoulder, a responsibility to the past. Shortly after 9/11 everything in Manhattan seemed to have intimate meaning. The supermarket shelves were empty of eyewash. A disused fire hydrant seemed connected to everything that ran beneath the city. A car on 85th Street sat collecting flowers: on the dashboard was a fireman's parking permit. A lone dog went across Brooklyn Bridge. Somehow each thing was linked with the next and the last. Clouds of dust still blew from a smouldering downtown. I didn't want to open my window. One evening I stood on Third Avenue and watched a woman eat a chocolate mousse cake: it seemed an odd and lovely moment of recovery, that the city would get back its greed. The question, as a writer, was how to find meaning at all when there was, in plain sight, a world charged with meaning. If everything meant something – even a child's simple question about burning – then how was it possible to create an alternative meaning, or more exactly, a novel? Years earlier, I had read an essay in Paul Auster's The Red Notebook: True Stories, about the walk that the French tightrope walker, Philippe Petit, had made across the World Trade Centre towers in 1974, a spectacular act of art and bravado where the funambulist had walked back and forth a quarter of a mile in the air. From below he might have looked like a speck of moving dust. The tightrope walk was an act of creation that seemed to stand in direct defiance to the act of destruction 27 years later. Nowadays it does not seem to be an original image. The walk itself has become iconic: Petit wrote a book called A Walk in the Clouds, and James Marsh made a wonderful documentary, Man on Wire. There has been a children's book, a play, paintings and talk of an animated film. But stories are there to be told, and each story changes with the telling. Time changes them. Logic changes them. Grammar changes them. History changes them. Each story is shifted sideways by each day that unfolds. Nothing ends. The only thing that matters, as Faulkner once put it, is the human heart in conflict with itself. At the centre of all this is the possibility, or desire, to create a piece of art that talks to the human instinct for recovery and joy. Originally I wanted my tightrope walker to fall, as the Bush years seemed to imply that he must: the administration had, after all, turned justice into revenge, and what better metaphor would there be than to pervert history, and to turn the art of the walk upside-down? But the more I worked on it, the more interested I became in the ordinary people on the street, the ones who walked a tightrope just one inch off the ground. I researched New York in 1974. The Bronx was burning. The soldiers were home from Vietnam, wearing either body bags or a uniform of shame. The city was going bankrupt. Artists were questioning themselves. Liberation theologians had a new twist on their God. The justice system was crumbling. The ARPAnet was developing a whole system of attachments and mails. The deeper I discovered the then of New York, the more profoundly it seemed to be talking towards the now. One of our dusty little secrets is that, in writing a novel, writers don't always know what we're doing. Most of it is instinct, driven by need. When Barack Obama got elected I thought that the story – so many years in the making – had to go in a different direction, and so I tried to push it that way, towards a point of recovery. Whether it succeeds or not is entirely out of my hands. There is the act of creative reading, and writing is more about a reader's imagination than anything else. One thing that has always struck me is how tenderly my father-in-law thinks of the young firefighters who were climbing the stairs of the towers while he was given the privilege of coming down. He will not forget them. He hears their boots. His own shoes sit in the box over my shoulder as I write – the suede is slightly crumpled, and some of the dirt has fallen into the box, and the laces are slightly open as if waiting to speak. Talk about immediate identification. The first sentence here encapsulates MANY exchanges on the sofa in front of our TV, even though we're more likely to be watching conspiracy thrillers than costume dramas. 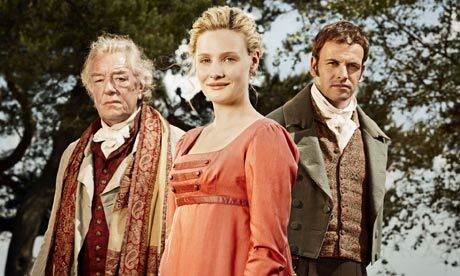 In Emma, the BBC's latest bonnet-based classic adaptation, the game known in various households as "Oh-my-god-where-have-we-seen-him-before-no-not-him-the-other-one-he's-from-that-thing" has reached its zenith. Anyone who's anyone is in it. To save you scratching the inside of your own brain out at 2am trying to place them all, we have done the heavy lifting for you. First few paragraphs of a Telegraph article (Philip Johnston, 12 Oct 2009) on the expenses scandal in today's House of Commons. I'd never known exactly why the present Houses of Parliament are so much younger than other Westminster buildings. The conflagration was so intense that its glow could be seen in the distant lanes of Surrey and Kent. 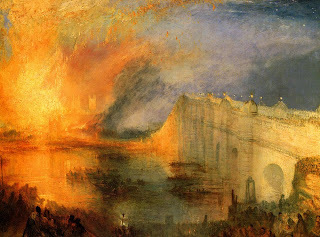 It was 175 years ago this week that the medieval Palace of Westminster, the home of the nation's parliament for 300 years, was burned to the ground. The calamitous fire was caused by the incineration of tally sticks – notched pieces of wood that for generations had signified the payment of tax and which had been stored under the House of Lords. Some years after the Exchequer had stopped using this method of counting, a great pile had accumulated and rather than give them away as firewood to the poor, which would have been sensible, it was decided to burn them. On the night of October 16, 1834, they began to load the sticks into the furnace. The blaze was so great that people walking on the floor above could feel the heat. Soon, the vaults were set alight and the ancient, mainly wooden, building was an inferno. Thousands came from miles around to gawp at the loss of the nation's legislative home (though, mercifully, the splendid Westminster Hall survived intact). Among the throng on the banks of the Thames that night was the country's greatest painter, JMW Turner, who made a sketch and later captured the spectacle in several magnificent oils. One spectator said the fire was "certainly the grandest thing we have ever witnessed" and commentators called it divine retribution for the gluttony and activities of the legislature, notably in passing the Reform Act just two years earlier. Imagine what they would say today were the familiar Gothic building that replaced the old palace to catch fire: if extending the electoral franchise and the abolition of the rotten boroughs was considered worthy of the wrath of God, what about rapacity on a grand scale? Letter from Benjamin Franklin, circa 1779, to his friend and fellow bon vivant, the economist André Morellet. Morellet actually was an abbé, but far from pious. I especially enjoyed the postscript on the design of the elbow. You have often enlivened me, my dear friend, by your excellent drinking songs; in return, I beg to edify you by some Christian, moral, and philosophical reflections upon the same subject. In vino veritas, says the wise man,—Truth is in wine. Before the days of Noah, then, men, having nothing but water to drink, could not discover the truth. Thus they went astray, became abominably wicked, and were justly exterminated by water, which they loved to drink. The good man Noah, seeing that through this pernicious beverage all his contemporaries had perished, took it in aversion; and to quench his thirst God created the vine, and revealed to him the means of converting his fruit into wine. By means of this liquor he discovered numberless important truths; so that ever since this time the word to divine has been in common use, signifying originally, to discover by means of WINE (VIN). Thus the patriarch Joseph took upon himself to divine by means of a cup or glass of wine, a liquor which obtained this name to show that it was not of human but divine invention (another proof of the antiquity of the French language, in opposition to M. Gébelin); nay, since that time, all things of peculiar excellence, even the Deities themselves, have been called Divine or Divinities. We hear of the conversion of water into wine at the marriage in Cana as of a miracle. But this conversion is, through the goodness of God, made every day before our eyes. Behold the rain which descends from heaven upon our vineyards; there it enters the roots of the vines, to be changed into wine; a constant proof that God loves us, and loves to see us happy. The miracle in question was only performed to hasten the operation, under circumstances of present necessity, which required it. It is true that God has also instructed man to reduce wine into water. But into what sort of water?—Water of Life (Eau de Vie). And this, that man may be able upon occasion to perform the miracle of Cana, and convert common water into that excellent species of wine which we call punch. My Christian brother, be kind and benevolent like God, and do not spoil his good drink. He made wine to gladden the heart of man; do not, therefore when at the table you see your neighbor pour wine into his glass, be eager to mingle water with it. Why would you drown truth? It is probable that your neighbor knows better than you what suits him. Perhaps he does not like water; perhaps he would only put in a few drops for fashion's sake; perhaps he does not wish any one to observe how little he puts in his glass. Do not, then, offer water, except to children; 'tis a mistaken piece of politeness, and often very inconvenient. I give you this hint as a man of the world; and I will finish as I began, like a good Christian, in making a religious observation of high importance, taken from the Holy Scriptures. I mean that the apostle Paul counselled Timothy very seriously to put wine into his water for the sake of his health; but that not one of the apostles or holy fathers ever recommended putting water into wine. To confirm still more your piety and gratitude to Divine Providence, reflect upon the situation which it has given to the elbow. You see in animals, who are intended to drink the waters that flow upon the earth, that if they have long legs, they also have a long neck, so that they can get at their drink without kneeling down. But man, who was destined to drink wine, must be able to raise the glass to his mouth. If the elbow had been placed nearer the hand, the part in advance would have been too short to bring the glass up to the mouth; and if it had been placed nearer the shoulder, that part would have been so long that it would have carried the wine far beyond the mouth. But by the actual situation, we are enabled to drink at our ease, the glass going exactly to the mouth. Let us, then, with glass in hand, adore this benevolent wisdom;—let us adore and drink! As we were driving through France, I was reminded of the photo below, sent by my cousin Cynthia, every time we passed a field of sunflowers. 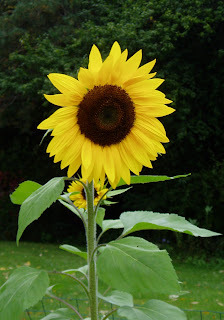 She had purchased the seeds, which were then scattered last June by her sister Kim and the youngest member of the family, 6-yr-old Sophia, in the garden on Currybush Road once tended by their much-loved father/grandfather. Michael's first gift this drizzly birthday morning is an e-mail from someone at the History Channel asking for some advice on sand for series 2 of the Life After People series. Many thanks to Alan Smith for putting the woman in Sherman Oaks, CA, in touch with his former grad student. Adds a little excitement to life even if, as is quite likely, Michael's labors will be unremunerated. The questions she needs answered finally came through yesterday (30 Sept), and they're going to require a lot of research on subjects like aeolian sand erosion of concrete structures. Michael's hoping their time frame will allow him to get back to London and his own library plus that at the Geological Society. On verra (we shall see). Our only fresh-squeezed orange juice on the trip appeared at this breakfast, along with dense loaf cakes that must be a Breton tradition (fortunately—or malhereusement for our ever-thickening ligne—there were also croissants and excellent bread). After wrestling our suitcases down the narrow outside steps from the second floor, we drove to Intermarché, where we sheltered from a massive downpour while picking up some single malt for the birthday boy and the wherewithal for a picnic or, as it turned out, in-car lunch. This day's adventures began by looking at beaches and former fishing villages like Perros-Guirec and Ploumanac'h along the Côte de Granit Rose. That pink granite had been sculpted by erosion into surreal shapes along the Sentier des Douaniers (Route of the Customs Officers—who were looking for contraband from England) and near Tregastel (sounds Cornish, looks Cornish), which locals had given names that translate as "Napoleon's Hat," "The Witch," The Upturned Foot," "The Skull," "The Corkscrew," "The Stack of Crêpes" (very French, those last two). I haven't a clue which ones we're looking at in these photos of both the craggy and smooth rock formations. Our next stop was a sop to me: Lannion, a town famous for its 15th- and 16th-century half-timbered houses. I've also included close-up photos of the carved caryatids characteristic of the architecture here. A while later we were munching our baguette, cheese, and salami in a parking lot at St-Michel-en-Grève. Most local lore in this very Catholic region centers on saints, but here there's a more recent 19th-century tale of Yann Ar Moch (John the Pork Butcher) who unleashed wild dogs on travelers who refused to pay the ransom he demanded. As our guidebook to Brittany & Normandy (Thomas Cook Publishing) said, "None of the bodies of Yann's victims was ever found; as he boasted after his capture—the Lieu de Grève was 'the best kept cemetery of all.'" In these post-Yann days, it's also a mecca for sand yachters. We figured the dismal weather meant we wouldn't see any, but no, wet sand must provide a good surface. Michael tried out his new video camera as well, and captured the moment when one of the yachts toppled over (no harm to vehicle or "sailor"). Turning around in a driveway on the way out of the boat launching area, we spotted another German pillbox, overgrown but still very obvious in the garden of a well-kept home. Would have taken a photo, but another vehicle was waiting to turn in, so we had to hurry out and continue our way along the Corniche Armorique. "Armorique" was the name early Celts used for what later became Petite Bretagne, when more Celts from the "Briton" tribe arrived in the 5th century AD, chased out of Grande Bretagne by the marauding Angles and Saxons. We drove past Morlaix, where the 5-yr-old Mary Queen of Scots had stayed in a convent on her way to Paris in 1548, already promised to the Dauphin of France, though the marriage didn't take place until 1558. More significantly for Michael, we also passed by Coreff. In1985 two Frenchmen who had fallen under the spell of real ale in Wales set up a brewery there. We managed to find some in a nearby Leclerc supermarket and it was indeed much better than the usual French brew. This Leclerc, like the Intermarché earlier in the day, had undercover parking, something we never see down in the much drier Laroque area. Whizzing by signs pointing to a lot more towns beginning with Plou, we eventually arrived in Finistère, from the Latin finis terrae, "end of the world"; the Bretons, however, called it Penn-Ar-Bed, "the beginning of land." Michael had decided he'd like to spend his birthday evening at the farthest western point of Europe, the rocky Finistère promontory of Pointe de St-Mathieu. The Hostellerie de la Pointe St-Mathieu was our most extravagant evening of the trip, again ***, but the high end of that category. Before dinner, we strolled across the road to see the lighthouse and the Benedictine monastery (begun in the 11th or 12th century and allowed to fall into ruin once the monks were driven out during the French Revolution). Michael was pleased to be standing on rocks of the Armorican orogeny. 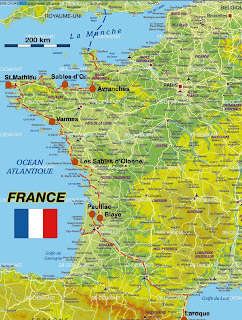 Just as Armorique became Bretagne, this orogeny has also lost its Breton roots and is now known as the Hercynian, though that too seems to have "proto-Celtic" roots. Whether geological or linguistic, this is all news to me. Dinner here was fromage ou dessert, just as well since "and" instead of "or" is a sure recipe for indigestion and, as you'll see, this meal was rich enough as it was. Michael began with a crab, clam, and foie gras crême brulée; my starter was far more foie gras based: a macaroon filled with foie gras cream, intensely citrusy foie gras cubes wrapped in duck, and a foie gras/apple mixture, all delicious. The birthday wine was a 1998 St. Estèphe. We toasted you, too, Mom. We didn't follow the "eat dessert first: life is short" maxim, but this last course would be a pretty damned good reason to do exactly that. Michael (first photo) chose from the dessert cart; the best was the fresh berries on top of some sort of cross between yoghurt and sweetened creamy cheese. My finale was a strawberry sorbet and chocolate millefeuille.